1-sided sanding pads are a highly flexible abrasive product coated with abrasive grit on a single side. They are the thinnest pads in the range. Used for sanding flat or contoured surfaces of metal, plastic or wood. The 1-sided pad can be made from either closed or open cell foam. We use a range of abrasive grit types including White Aluminium Oxide, Black Silicon Carbide and Green Silicon Carbide. The choice of grit type and grade determines how aggressive the sanding process will be. Grit grades with lower numbers are coarser and more aggressive. Higher grit grades are used for finer finishing. Our 1-sided sponge sanding pads are offered in a grit grade range of 60 to 320. To maintain performance, 1-sided sanding pads are washable and can be used wet or dry. 1-sided sanding pads can be printed on the foam side using our screen printer. We offer standard print or can create a print of your own brand marking. 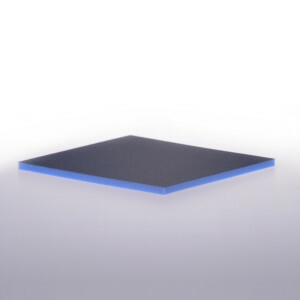 1-sided sanding pads can also be supplied with a Velcro receptive backing, either as a rectangular pad or a disc, allowing them to be used with power tools.